A journal documenting the everyday life of new author. 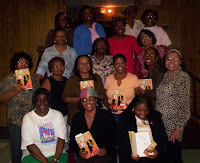 Last October 2007, I was invited to a book club reading and discussion of Choose Me by the Women of Integrity Book Club. The book club consists of a group of women who meet at Mt. Eagle Baptist Church on Chicago's South Side, headed by the church's First Lady, E'Lisa Hooks. They meet quarterly and always choose an inspirational book with messages relevant to their godly lives. Approximately 20 women showed up at the October 9 reading/discussion. The Women of Integrity Book Club provided me with good and bad comments – mostly good. We shared our experiences with temptations of the flesh and current and past relationships. I enjoyed the experience and didn’t take the negative comments at heart. It was difficult to keep quiet, though, especially when everyone was so eager to speak. They had a two-page list of discussion questions ready (great questions!) and I felt blessed and renewed in my path to remain celibate. There was an array of food available & it was hard to wait until after the discussion to eat. After the discussion and dinner, I signed their books and we took pictures (for some reason, my sister only took the one posted here with my camera; she had more in her camera). I’ve been trying to connect with Latina book clubs, but so far, I’ve been unsuccessful. Recently though, I got an invitation to join the Las Comadres on-line Book Club, which is going to start in March. Hopefully, my book will be selected (hint, hint). It was never my intent to write a Christian novel. In 1997, I finished writing my first novel. Although I had an agent, the novel was rejected by several publishers; one major publisher expressed interest -- if I changed the format to their specifications. I refused and put it aside. One night, while browsing through my novels-in-progress I came across a 10,000-word manuscript about a woman and man who, disillusioned by love, seek something deeper. Nine months later a more spiritual, in-depth 120,000-word novel evolved, which ultimately became CHOOSE ME. In October 2003, I submitted the manuscript to Walk Worthy Press whose publisher turned out to be my former agent. Some people call it coincidence, I call it fate. My 2nd novel (which is ironically my first) tentatively entitled IN THE PICTURE I HAVE OF YOU, is under consideration for publication. In 2006, I self-published my "3rd" book, BORICUA MORENA: MEMOIRS OF A HUMBOLDT PARK GIRL, a collection of essays, poetry & short stories. Currently, I am editing my 3rd novel, NEGRITA MEANS LOVE and my second self-published book, a children's memoir, HUMBOLDT PARK DAYS. TWO BLESSINGS IN ONE DAY!